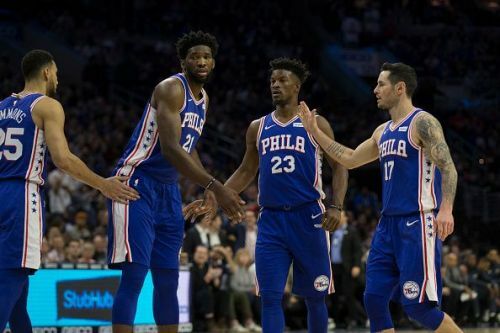 The Toronto Raptors and the Philadelphia 76ers met for the first time since the big trade between the 76ers and the Timberwolves that sent Jimmy Butler to Philly. Philadelphia was 8-2 with Butler in their lineup and the Raptors had just lost on Monday night to Denver after 8 straight wins. This game was a huge test for both sides. Toronto want to dominate the East without LeBron James, and Philadelphia needs to beat teams like the Raptors to prove they are an elite team in the East. The Raptors had beaten the 76ers in 12 straight games at Toronto and, on Wednesday night, even with the addition of Butler, nothing changed. The Raptors, who for the third straight game were not shooting well, found themselves leading at halftime by 4, at 53-49. The Raptors feasted on 11 second-quarter turnovers by Philadelphia, along with stifling defence to wrest control of the game at halftime. The Raptors would win this game 113-102. Shooting 8/29 from 3 point range for 27.6 percent and just 43 percent overall from the field. Toronto held Philadelphia to 31.4 percent from behind the arc and while Butler went off for 38 points in 38 minutes, and J.J. Reddick had 25 points, the only other 76ers player to score double-digit figures was Joel Embiid at 10 points on 5/17 shooting. The Raptors received 36 points from Kawhi Leonard, 26 from Jonas Valuanciunas and 18 from Serge Ibaka. Since trading for Butler, the 76ers were 8-2. However, the loss of Dario Saric, Jerryd Bayless and Robert Covington means Philadelphia is top heavy and light on bench production. Last night was a prime example of this. In a total of about 71 minutes off of the bench, four Philadelphia substitutes tallied 18 points. Also, four of the 76ers' starters played 34-plus minutes. In contrast, the Toronto Raptors played their 12 men.